Off-the-shoulder long formal dresses are big this season, so this beautiful evening dress is well-suited for your special event. Embroidered illusion lace tops this lovely formal dress with an off-the-shoulder neckline and draped banded sleeves. Dotted with tonal beading, tendrils of embroidered lace extend over the natural waistline and onto the long jersey skirt that flares out from the knees in dramatic mermaid style. 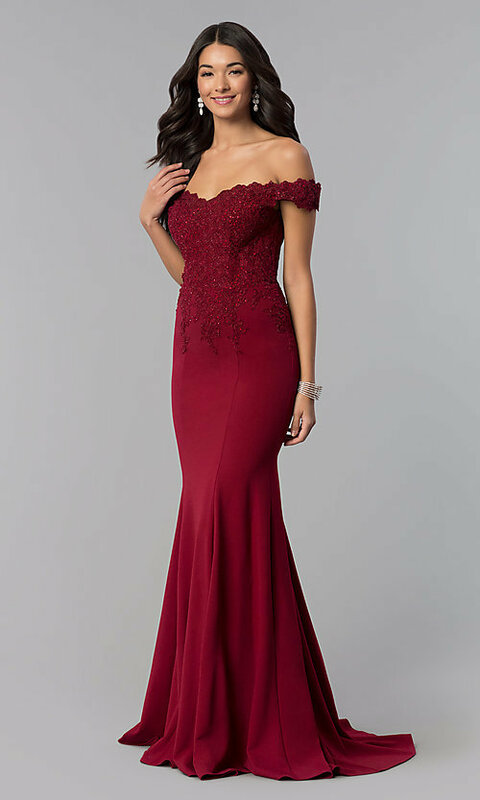 For an elegant look at winter formals or pageants, this off-the-shoulder long evening dress, under $250, is an impressive, yet affordable option that is available in misses and plus sizes.